Snack and lunch at the Rise School focus on more than just food consumption. These routines help students develop lasting healthy eating habits, table manners and positive relationships with food. Mealtimes are an enjoyable, social time for students, where teachers and therapists encourage peer interaction, food exploration and self-help skills. I’ve shared some strategies below to promote positive healthy eating at home. Involve your child in meal prep. When your child is engaged in meal preparation, she will be more interested in the meal. Every child can participate on some level. Have your child create a grocery list or help with the shopping. In the kitchen she can pour, mix, break (or cut), and put ingredients into containers. Setting the table is another great child friendly task. Store some plastic cups and bowls in a cabinet your child can reach to encourage more independence. Remember watching and counting while parents cook is helping too! Establish mealtime routines. Routines should begin prior to sitting down at the table. Be sure to give your child time to prepare for the transition. Verbal countdowns, visual timers and schedules can be helpful. Make it a rule to clean up toys, turn off electronics and wash hands before every meal. You can also add setting the table with preferred placemats, dishes or utensils or helping carry food to the table. Continue the routine after mealtime for bedtime, transition to school, etc. - routines help children feel safe, anticipate what is coming next, and learn independence. Set up for success. 90-90-90 seating (as pictured) is ideal during mealtime, so they are fully supported physically and can focus on eating. 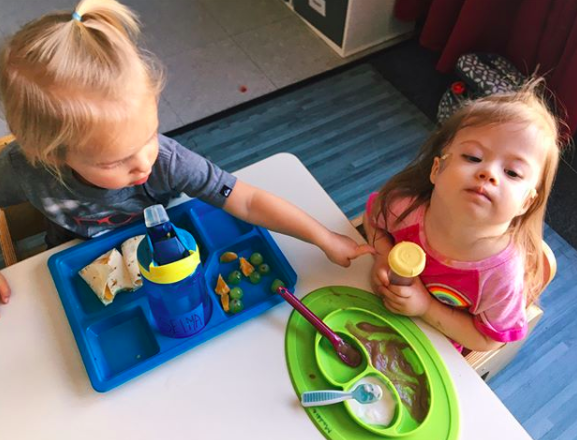 Provide your child with options for utensils and dishes to promote independence. Rise students use a variety of weighted or shaped utensils, trays, mats (we LOVE the ezpz mats), and cups. Please ask your child’s teacher what he is most successful with here. If your child eats mostly finger foods, provide a utensil for practice or to explore (poke, mix, scoop) less preferred foods. Model. Model. Model. Modeling healthy and appropriate eating habits is critical to successful mealtimes. Sit with your child and eat and as much as possible, eat the same foods. Model serving yourself, using utensils, and tasting, eating, exploring food. If your child is a picky eater or resists trying new foods it is important to model interacting with the food in a way that does not immediately focus on eating. For example, explore a food by serving into a separate dish and mix, mash, or scoop the food with a utensil without eating it. Sing a preferred song as you do this and invite your child to take a turn. Work up to modeling tasting or eating the food slowly - possibly across multiple meals depending on your child’s willingness to explore. Socialize. Making mealtime a social time often creates a positive environment and positive attitudes toward food. Try serving meals family style for more opportunities to exchange dishes and take turns and of course model. Share highlights and lowlights of the day. Keep questions to a minimum and model talking about your day or ask your child multiple choice questions. (Did you play outside or in the gym? Did you see Megan at school today?) Talk about the food you see and are eating. Describe color, shape, taste, temperature, texture, etc. and encourage your child to do the same.